Regulation (EC) No 715/2007 is one of the separate regulatory acts under the type-approval procedure laid down by Directive 2007/46/EC of the European Parliament and of the Council (2). Regulation (EC) No 715/2007 requires new light-duty vehicles to comply with certain emission limits and lays down additional requirements on access to information. The specific technical provisions necessary to implement that Regulation were adopted by Commission Regulation (EC) No 692/2008 (3). The Commission has performed a detailed analysis of the procedures, tests and requirements for type-approval that are set out in Regulation (EC) No 692/2008 on the basis of own research and external information and found that emissions generated by real driving of Euro 5/6 vehicles on the road substantially exceed the emissions measured on the regulatory new European driving cycle (NEDC), in particular with respect to NOx emissions of diesel vehicles. The type-approval emission requirements for motor vehicles have been gradually and significantly tightened through the introduction and subsequent revision of Euro standards. While vehicles in general have delivered substantial emission reductions across the range of regulated pollutants, this was not the case for NOx emissions from diesel engines, in particular light-duty vehicles. Actions for correcting this situation are therefore needed. ‘Defeat devices’ as defined in Article 3(10) of Regulation (EC) No 715/2007 reducing the level of emission control are prohibited. Recent events have highlighted the need to strengthen the enforcement in this respect. Therefore it is appropriate to require a better supervision of the emission control strategy applied by the manufacturer at type-approval, following the principles already applied to heavy-duty vehicles by Euro VI Regulation (EC) No 595/2009 and its implementing measures. Addressing the problem of NOx emissions from diesel vehicles should contribute to decreasing the current sustained high levels of NO2 concentrations in ambient air, which are a major concern regarding human health. The Commission has established in January 2011 a working group involving all interested stakeholders for developing a real driving emission (RDE) test procedure better reflecting emissions measured on the road. For this purpose, and after thorough technical discussions, the option suggested in Regulation (EC) No 715/2007, i.e. the use of portable emission measurement systems (PEMS) and not-to-exceed (NTE) limits, has been followed. As agreed with stakeholders in the CARS 2020 process (4), the RDE test procedures should be introduced in two phases: during a first transitional period the test procedures should only be applied for monitoring purposes, while afterwards they should be applied together with binding quantitative RDE requirements to all new type-approvals and new vehicles. The RDE test procedures were introduced by Commission Regulation (EU) 2016/427 (5). It is now necessary to establish the quantitative RDE requirements in order to limit tailpipe emissions under all normal conditions of use pursuant to the emission limits set out in Regulation (EC) No 715/2007. For that purpose, statistical and technical uncertainties of the measurement procedures should be taken into account. In order to allow manufacturers to gradually adapt to the RDE rules, the final quantitative RDE requirements should be introduced in two subsequent steps. In the first step, which should start applying 4 years after the dates of mandatory application of the Euro 6 standards, a conformity factor of 2,1 should apply. The second step should follow 1 year and 4 months after the first step and should require full compliance with the emission limit value for NOx of 80 mg/km set out in Regulation (EC) No 715/2007 plus a margin taking into account the additional measurement uncertainties related to the application of portable emission measurement systems (PEMS). While it is important that all possible driving situations are potentially covered by RDE testing, it should be avoided that the tested vehicles are driven in a biased manner, i.e. with the intention to generate a passed or failed test not by virtue of the technical performance of the vehicle but due to extreme driving patterns. Therefore, complementary boundary conditions for RDE testing are introduced in order to address such situations. Due to their very nature, driving conditions encountered during individual PEMS trips may not fully correspond to ‘normal conditions of use of a vehicle’. The severity of emission control during such trips may therefore vary. As a consequence, and in order to take into account the statistical and technical uncertainties of the measurement procedures, it may be considered in the future to reflect in the NTE emission limits applicable to individual PEMS trips the characteristics of those trips, described by certain measurable parameters, e.g. related to the driving dynamics or workload. If that principle is applied, it should not lead to the weakening of the environmental effect and the effectiveness of the RDE test procedures, which should be demonstrated by a peer-reviewed scientific study. In addition, for the assessment of the severity of emission control during a PEMS trip, only parameters that can be justified by objective scientific reasons and not just by reasons of calibration of the engine or the pollutant control devices or the emission control systems should be taken into account. Finally, recognising the need to control NOx emissions in urban conditions, urgent consideration shall be given to changing the relative weighting of the urban, rural and motorway elements of the RDE test to ensure a low conformity factor can be achieved in practice, creating a further boundary condition relating to driving dynamics in the third regulatory RDE package above which the extended conditions shall be applicable from the step 1 introduction dates. The Commission shall keep under review the provisions of the RDE test procedure and adapt those provisions to accommodate new vehicle technologies and to ensure their effectiveness. Similarly, the Commission shall keep under annual review the appropriate level of the final conformity factor in light of technical progress. It shall in particular review the two alternative methods for evaluating PEMS emission data set out in Appendices 5 and 6 to Annex IIIA to Regulation (EC) No 692/2008 with a view to developing a single method. It is therefore appropriate to amend Regulation (EC) No 692/2008 accordingly. ‘auxiliary emission strategy’ (hereinafter ‘AES’) means an emission strategy that becomes active and replaces or modifies a BES for a specific purpose and in response to a specific set of ambient or operating conditions and only remains operational as long as those conditions exist.’. ‘Until three years after the dates specified in Article 10(4) and four years after the dates specified in Article 10(5) of Regulation (EC) No 715/2007 the following provisions shall apply:’. ‘The requirements of point 2.1 of Annex IIIA shall not apply.’. a description of the fuel system control logic, timing strategies and switch points during all modes of operation. The extended documentation package referred to in paragraph 11 shall remain strictly confidential. It may be kept by the approval authority, or, at the discretion of the approval authority, may be retained by the manufacturer. In the case the manufacturer retains the documentation package, that package shall be identified and dated by the approval authority once reviewed and approved. It shall be made available for inspection by the approval authority at the time of approval or at any time during the validity of the approval.’. Appendix 6 to Annex I is amended as set out in Annex I to this Regulation. Annex IIIA is amended as set out in Annex II to this Regulation. Done at Brussels, 20 April 2016. (2) Directive 2007/46/EC of the European Parliament and of the Council of 5 September 2007 establishing a framework for the approval of motor vehicles and their trailers, and of systems, components and separate technical units intended for such vehicles (Framework Directive) (OJ L 263, 9.10.2007, p. 1). (4) Communication from the Commission to the European Parliament, the Council, the European Economic and Social Committee and the Committee of the Regions CARS 2020: Action Plan for a competitive and sustainable automotive industry in Europe (COM(2012) 636 final). ‘“Euro 6d” emissions standard= Full Euro 6 emission requirements, i.e. Euro 6b emission standard, final particle number standards for PI vehicles, use of E10 and B7 reference fuel (where applicable) assessed on regulatory lab test cycle and RDE testing against final conformity factors;’. “margin” is a parameter taking into account the additional measurement uncertainties introduced by the PEMS equipment, which are subject to an annual review and shall be revised as a result of the improved quality of the PEMS procedure or technical progress. The application of temporary conformity factors shall be recorded in the certificate of conformity of the vehicle. The transfer function TF(p1,…, pn ) referred to in point 2.1 is set to 1 for the entire range of parameters pi (i = 1,…,n). Mgas,d,t ≤ NTEpollutant and Mgas,d,u ≤ NTEpollutant with the definitions of point 2.1 of this Annex and points 6.1 and 6.3 of Appendix 5 and the setting gas = pollutant. The overall excess or insufficiency of driving dynamics during the trip shall be checked using the methods described in Appendix 7a to this Annex. The standard power frequencies are defined for urban driving and for the total trip (see paragraph 3.4) and a separate evaluation of the emissions shall be made for the total trip and for the urban part. The three second moving averages calculated according to paragraph 3.3 shall therefore be allocated later to urban and extra-urban driving conditions according to the velocity signal (vi) from the actual second i as outlined in Table 1-1. 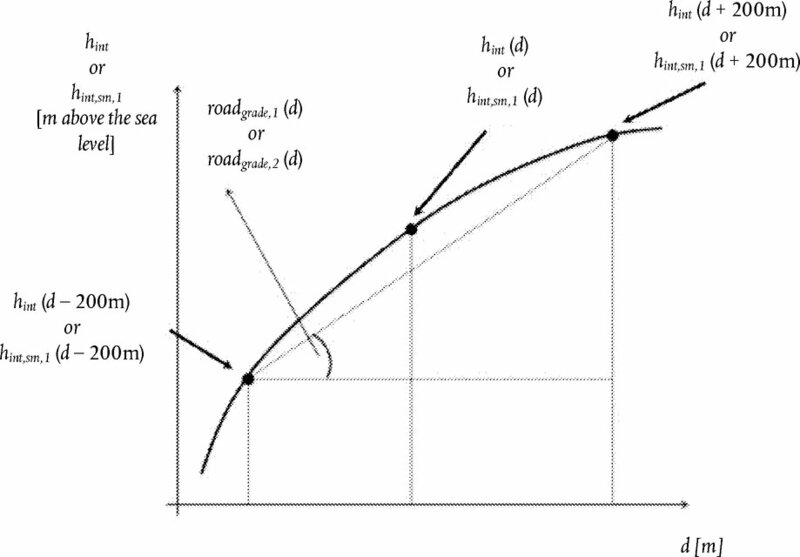 This Appendix describes the calculation procedures to verify the overall trip dynamics, to determine the overall excess or absence of dynamics during urban, rural and motorway driving. actual vehicle speed per positive acceleration greater than 0,1 m/s2 in time step j considering the urban, rural and motorway shares [m2/s3 or W/kg]. Dynamic parameters like acceleration, v · apos or RPA shall be determined with a speed signal of an accuracy of 0,1 % above 3 km/h and a sampling frequency of 1 Hz. This accuracy requirement is generally fulfilled by wheel (rotational) speed signals. The speed trace shall be checked for faulty or implausible sections. 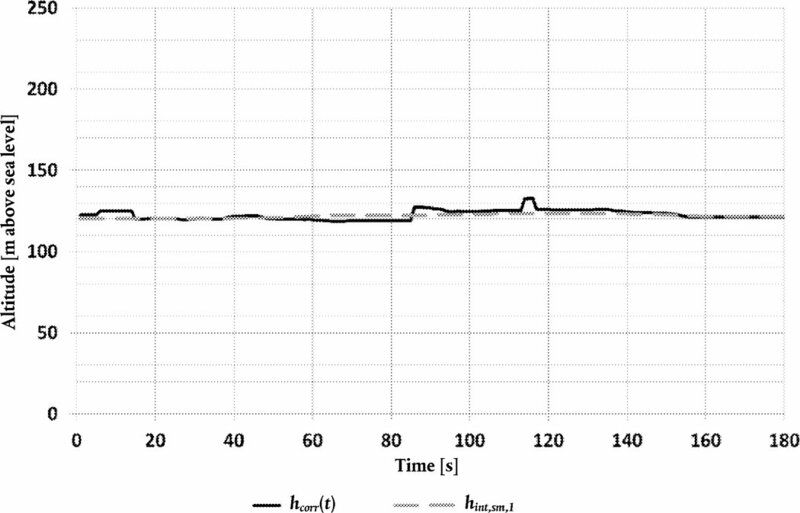 The vehicle speed trace of such sections is characterised by steps, jumps, terraced speed traces or missing values. Short faulty sections shall be corrected, for example by data interpolation or benchmarking against a secondary speed signal. Alternatively, short trips containing faulty sections could be excluded from the subsequent data analysis. In a second step the acceleration values shall be ranked in ascending order, in order to determine the acceleration resolution ares = (minimum acceleration value > 0). If ares ≤ 0,01 m/s 2, the vehicle speed measurement is accurate enough. If 0,01 < ares ≤ rmax m/s2, smoothing by using a T4253 Hanning filter. If ares > rmax m/s2, the trip is invalid. The T4253 Hanning filter performs the following calculations: The smoother starts with a running median of 4, which is centred by a running median of 2. It then re-smoothes these values by applying a running median of 5, a running median of 3, and Hanning (running weighted averages). Residuals are computed by subtracting the smoothed series from the original series. This whole process is then repeated on the computed residuals. Finally, the smoothed residuals are computed by subtracting the smoothed values obtained the first time through the process. The correct speed trace builds the basis for further calculations and binning as described in paragraph 3.1.2. The following calculations shall be performed over the whole time-based speed trace (1 Hz resolution) from second 1 to second tt (last second). ai is the acceleration in time step i [m/s2]. For i = 1: vi – 1 = 0, for i = Nt : vi + 1 = 0. (v · a)i is the product of the actual vehicle speed per acceleration in time step i [m2/s3 or W/kg]. After the calculation of ai and (v · a)i , the values vi , di , ai and (v · a)i shall be ranked in ascending order of the vehicle speed. All datasets with vi ≤ 60 km/h belong to the ‘urban’ speed bin, all datasets with 60 km/h < vi ≤ 90 km/h belong to the ‘rural’ speed bin and all datasets with vi > 90 km/h belong to the ‘motorway’ speed bin. The number of datasets with acceleration values ai > 0,1 m/s2 shall be bigger or equal to 150 in each speed bin. Nk is the total number of samples of the urban, rural, and motorway shares. The (v · a)i,k values in each speed bin shall be ranked in ascending order for all datasets with ai,k ≥ 0,1 m/s 2 and the total number of these samples Mk shall be determined. The lowest v · apos value gets the percentile 1/Mk , the second lowest 2/Mk , the third lowest 3/Mk and the highest value Mk/Mk =100 %. (v · apos)k _ is the (v · apos)j,k value, with j/Mk = 95 %. If j/Mk = 95 % cannot be met, (v · apos)k _ shall be calculated by linear interpolation between consecutive samples j and j + 1 with j/Mk < 95 % and (j + 1)/Mk > 95 %. the total sample number for urban, rural and motorway shares. is fulfilled, the trip is invalid. If and is fulfilled, the trip is invalid. If and RPAk < 0,025 is fulfilled, the trip is invalid. This Appendix describes the procedure to determine the cumulative elevation gain of an RDE trip. vehicle speed of data point t [km/h]. The cumulative positive elevation gain of an RDE trip shall be determined based on three parameters: the instantaneous vehicle altitude hGPS,i [m above sea level] as measured with the GPS, the instantaneous vehicle speed vi [km/h] recorded at a frequency of 1 Hz and the corresponding time t [s] that has passed since test start. The cumulative positive elevation gain of an RDE trip shall be calculated as a three-step procedure, consisting of: (i) the screening and principle verification of data quality; (ii) the correction of instantaneous vehicle altitude data; and (iii) the calculation of the cumulative positive elevation gain. vehicle altitude based on topographic map at data point t [m above sea level]. corrected instantaneous vehicle altitude at data point t-1 [m above sea level]. Upon the completion of the correction procedure, a valid set of altitude data is established. This data set shall be used for the final calculation of the cumulative positive elevation gain as described in point 4.4. The cumulative elevation gain shall be calculated from data of a constant spatial resolution of 1 m starting with the first measurement at the start of a trip d(0). The discrete data points at a resolution of 1 m are referred to as way points, characterised by a specific distance value d (e.g., 0, 1, 2, 3 m…) and their corresponding altitude h(d) [m above sea level]. cumulative distance travelled until the measurement located directly after the respective way point d [m]. cumulative distance travelled until the last discrete way point [m]. The positive cumulative elevation gain of a trip shall be calculated by integrating all positive interpolated and smoothed road grades, i.e. roadgrade,2(d). The result should be normalised by the total test distance dtot and expressed in meters of cumulative elevation gain per 100 kilometres of distance. Tables 1 and 2 show the steps performed in order to calculate the positive elevation gain on the basis of data recorded during an on-road test performed with PEMS. For the sake of brevity an extract of 800 m and 160 s is presented here. As result of the applied data verification, the data in the fifth column h(t) are obtained. As result of the applied data correction, the data in the sixth column hcorr(t) are obtained. 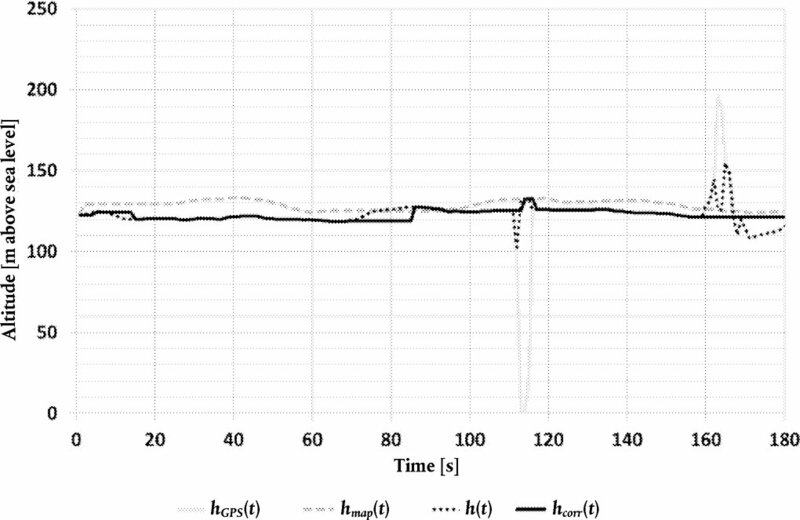 The effect of the applied verification and correction steps on the altitude data is depicted in Figure 2. The positive cumulative elevation gain of a trip is calculated by integrating all positive interpolated and smoothed road grades, i.e. roadgrade,2(d). For the presented example the total covered distance was dtot = 139,7 km and all positive interpolated and smoothed road grades were of 516 m. Therefore a positive cumulative elevation gain of 516 × 100/139,7 = 370 m/100 km was achieved. (1) CO emissions shall be measured and recorded at RDE tests. (2) CO emissions shall be measured and recorded at RDE tests.